Welcome to The Drive Cleaner, a Hertfordshire Based Company. We are professional cleaning service specialising in driveways, patios and paths, walls, decking,swimming pool areas and tennis courts. Using the latest rotary pressure technology specifically designed for the purpose, cleaning capabilities are at maximum, without risk of damage to the surface. Displaced mess is contained to keep splashing to a minimum, keeping the neighbours happy! Is your driveway or patio looking worse for wear after the winter? Moss and green algae can look unsightly and can be dangerously slippery. We can remove this grime and restore the area to its former glory. 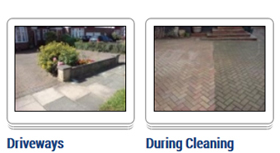 When block paving is properly cleaned and resanded, it can look like it is brand new and just been laid. Application of a sealant will protect the surface and prolong its lifespan. If you’re selling your property, the buyer’s first impression is very important. An unkempt looking driveway can result in getting a reduced offer or putting people off purchasing. 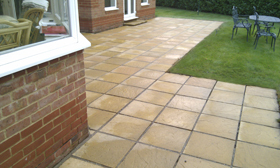 Your old surface can be cleaned at a fraction of replacement costs. Regular cleaning will not only make your home look better but also prolongs the life of the surface. Please view our work gallery to see the results have been achieved. Please note this is not just a jet washing service.